It's been a busy start to the new year, which has been quite nice. 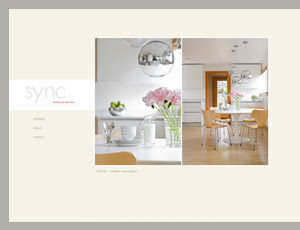 Our new site for Sync Interior Design went live this week which was great. It's a sleek, clean, site that doesn't get bogged down with a lot of text. Instead Sync uses photo grouping of their interiors to express their style. Have to say I'm pleased with how it turned out the the fun collaborative process with Kim, Sync's owner.